No guide is known who can shelter the world from woe, None who knows what moves and works Thy lofty plans. 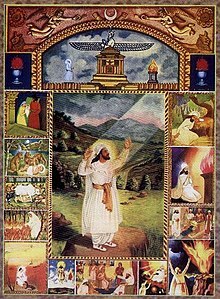 Zoroaster, also known as Zarathustra or Zartosht, was the prophet of the Zoroastrian religion. It is now thought that he lived in eastern Iran or in central Asia around 1000 BC. The Gathas are hymns held by believers to have been written by Zoroaster. Translation by Dinshaw Jamshedji Irani, in K. D. Irani, Rabindranath Tagore, The Gathas: the Hymns of Zarathushtra, K.R. Cama Oriental Institute, 1999, 96 p. at Zarathustra.com. Truth is best (of all that is) good. As desired, what is being desired is truth for him who (represents) the best truth. None who knows what moves and works Thy lofty plans." Let each one choose his creed with that freedom of choice each must have at great events. An enemy of my faith, a destroyer of Thy principles is he, O Lord! Among the Chaldeans the most famous name is that of Zoroaster, who is held to have been the author of their religion, their civil policy, their sciences, and their magic. He taught the doctrine of two great principles, the one the author of good, the other of evil. He prohibited the use of images in the ceremonies of religion, and pronounced that nothing deserved homage but fire, and the sun, the centre and the source of fire, and these perhaps to be venerated not for themselves, but as emblematical of the principle of all good things. He taught astronomy and astrology. We may with sufficient probability infer his doctrines from those of the Magi, who were his followers. He practised enchantments, by means of which he would send a panic among the forces that were brought to make war against him, rendering the conflict by force of arms unnecessary. He prescribed the use of certain herbs as all−powerful for the production of supernatural effects. He pretended to the faculty of working miracles, and of superseding and altering the ordinary course of nature.—There was, beside the Chaldean Zoroaster, a Persian known by the same name, who is said to have been a contemporary of Darius Hystaspes. William Godwin, Lives of the Necromancers (1835), p. 24. Zarathustra was the first to see in the struggle between good and evil the essential cycle in the working of things. The translation of morality into the realm of metaphysics, as force, cause, as end in itself, is his work. But the very question presents its own answer. Zarathustra created this most fateful of all errors—morality; therefore he must be the first to recognize it. This page was last edited on 1 July 2018, at 20:47.